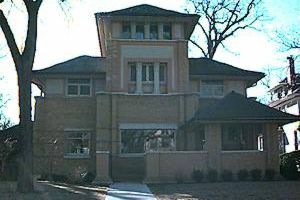 Wright designed this house for Rollin Furbeck about six months after the one he built for his brother George. Each of these houses has historical significance, as they marked the beginning of Wright's three year period of experimentation that by 1900 had emerged into Wright's modern style. Aspects of that style which appear in this design include its solid rectangular masses, its horizontal accenuated stucco band between brick wall and roof, and in its hip roof of low pitch. A detailed history of the Rollin Furbeck house is available.